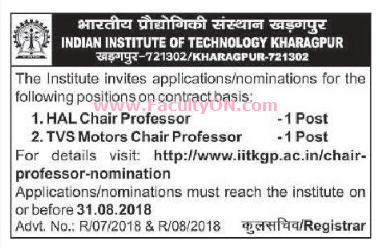 Indian Institute of Technology, Kharagpur has advertised in THE TELEGRAPH newspaper for recruitment of HAL Chair Professor / TVS Motor Chair Professor jobs vacancies. Interested and eligible job aspirants are requested to apply on or before 31st August 2018. Check out further more details below. About College: The motto of IIT Kharagpur is "Yogah Karmasu Kaushalam". This literally translates to "Excellence in action is Yoga", essentially implying that doing your work well is (true) yoga. This can be traced to Sri Krishna's discourse with Arjuna in the Bhagavad Gita. The quote, in the larger context of the Gita, urges man to acquire equanimity because a mind of equanimity allows a man to shed distracting thoughts of the effects of his deeds and concentrate on the task before him. Equanimity is the source of perfection in Karmic endeavours that leads to Salvation. How to Apply: Interested and eligible candidates are requested to send application along with all copies of certificates / testimonials and recent PP size photos to the postal address provided here.